Steel & Aluminum Deck Trucks - Roll-A-Way Conveyors Inc.
STEEL DECK: Steel deck platform trucks are constructed of 12 gauge steel. All parts are welded. Non-tilt type. Added cross member support. Removable end rack. 2 swivel and 2 rigid casters with 8” diameter wheels (4”, 5” and 6” available). Powder coated blue. Option extras include rubber bumpers. 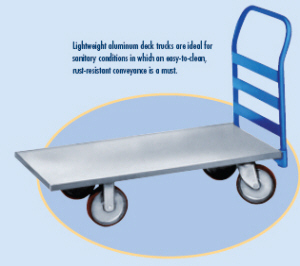 ALUMINUM DECK: Aluminum trucks are light weight, attractive, corrosion resistant, and non-toxic. the aluminum material is 3/16” thick (diamond tread) supported by full length angle and cross brace caster bolsters. Removable end racks. Ideal for institutional usage. A wide range of wheel types and sizes is available to suit every conceivable application and floor condition. When selecting a caster, always consider the wheel diameter for load weight, floor conditions, floor protection, and whether quiet operation is desired.